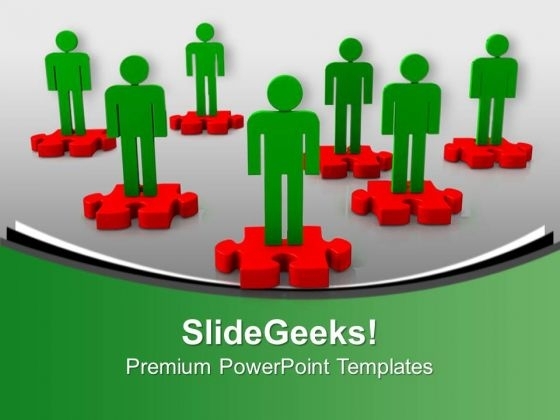 Deliver amazing Presentations with our above template which contains an image of 3d persons standing on jigsaw puzzle pieces. This image represents the concept of teamwork and business challenge. Adjust the above image in your PPT presentations to visually support your content in your Leadership PPT slideshows solution, partnership etc. Our PPT images are so ideally designed that it reveals the very basis of our PPT template to make your clients understand. Display world class leadership with our Team On Puzzles Teamwork PowerPoint Templates And PowerPoint Themes 1012. They will make you look good. Entice listeners both near and far. Our Team On Puzzles Teamwork PowerPoint Templates And PowerPoint Themes 1012 have an alluring effect.